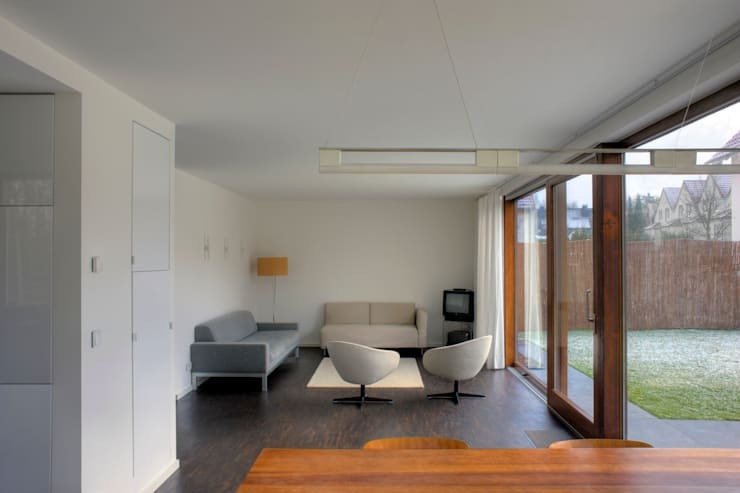 Today, we are going to travel to Germany where design professionals Puschmann Architecture have created a home that epitomises minimalist beauty and functionality. We will learn how we too can create a home that is sleek, stylish and simple. This home is the perfect example of how a design can speak volumes by employing the most basic yet sophisticated elements. We may even learn a few tips here and there! 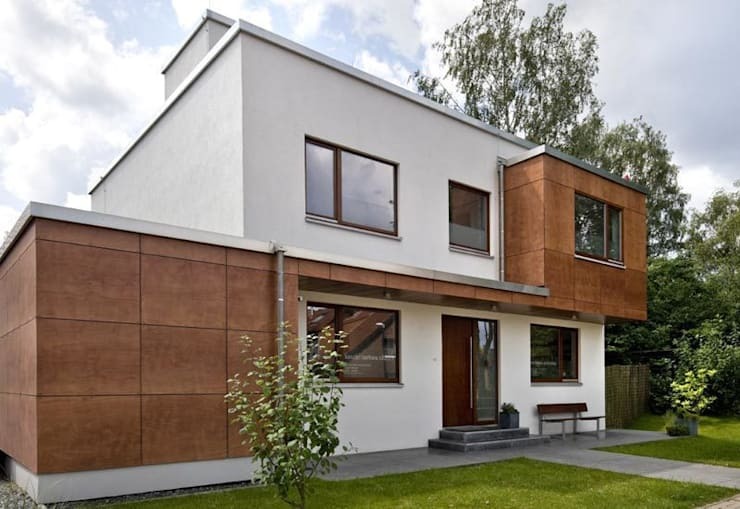 From this angle, we can see how the house is featured on two levels and employs two very distinct colours, tones and materials. The smooth white plastered walls contrast beautifully with the sandy-brown tiled facade, creating a very stylish and trendy look and feel. The glass windows and doors also add a different dimension to the facade. The garden is very neat and organised with a manicured lawn and clean lines distinguishing the garden path. This is a great design tip, especially for a minimalist home! Your garden should be simple but effective, enhancing the facade. Invest in a gardener or make sure you regularly clean, trim and chop in your garden. If we go around to the back of the house, we come across a very stylish and functional space—characteristic of a minimalist design. Large glass doors and windows allow the interior of the home to flow out onto the exterior space, creating a larger living space as well as an area where the family can enjoy the fresh air and sunshine. We can see that the designers have placed a material cloth on the wall, which extends out and offers the exterior space shade and shelter. 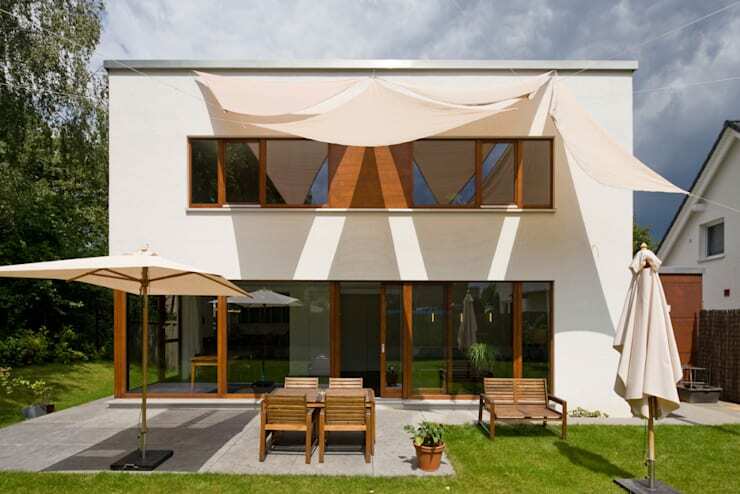 It also softens the facade, creating a lighter flow. Have a look at these other 7 wonderful roof terrace ideas. There are also umbrellas that have been placed around the backyard, providing cool spaces for the family to relax outside. The designers have chosen gorgeous wooden furniture for this space, which provides both a dining spot and a relaxing bench so that there are plenty of functionalities for this area of the home. As we explore the interior of the home, you'll notice that there is plenty of natural light, creating a very light, bright and spacious looking home. There are glass windows and doors utilised throughout the home, ensuring that sunlight streams in at every possible angle and moment. 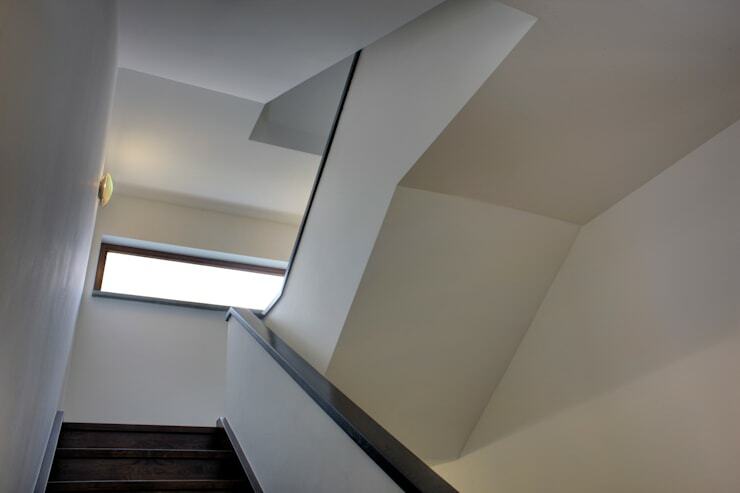 In this image, we can see how the staircase has been completely opened up thanks to the window that runs along the entire length of the landing. When it comes to a modern home with a minimalist design, you will need to invest in ample storage space like the designers have done here. Invest in cupboards, shelves and drawers where ever possible so that you can store anything that isn't functional or necessary neatly out of sight. This allows the design to remain sleek and simple. When it comes to storage, you also want to maximise vertical space so that you leave the floor space as under-used as possible. 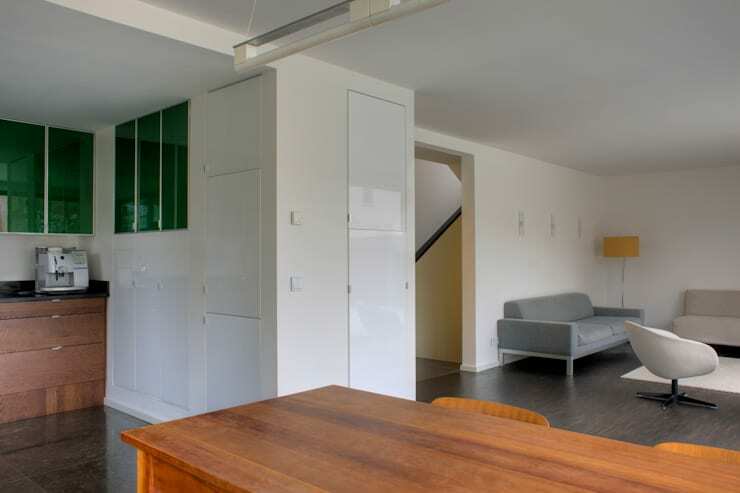 In this image, we can also see how well an open plan design works. It allows the rooms to flow into one another, creating a very stylish and sophisticated look and feel. It also makes the home seem so big! The interior employs a neutral colour palette of grey, white and wood, which creates a very soft, warm and inviting look and feel. You'll see that a splash of colour has been added in the form of a bright yellow lampshade—a wonderful tip. Use small objects such as cushions or lampshades to create a bright and cheerful touch here and there. You can also use artwork to bring in some personality and charm. The neutral tones are enhanced by the natural light that fills this space, thanks to the large glass windows and doors. Curtains provide the family with privacy if need be or allow for a bit of interior shade from the sunlight. Tip: Use soft, light colours for curtains so that your interior space remains light and warm. We end off our tour looking at the architectural model of the house before it was built. 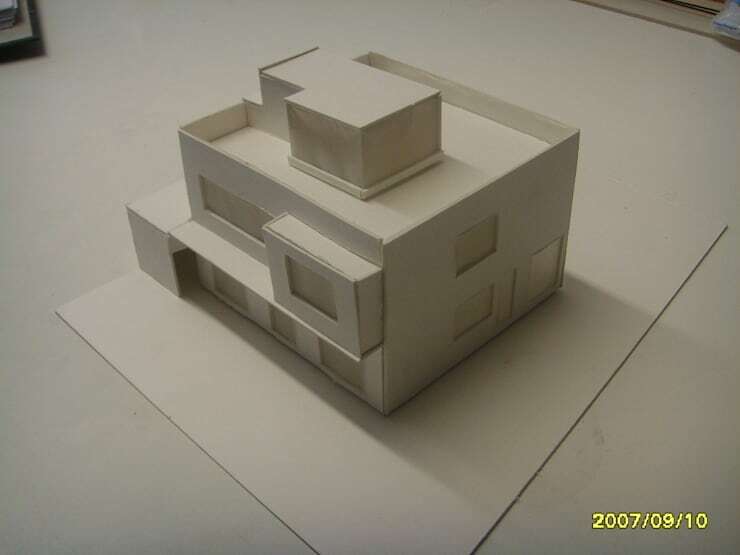 This 3D model allowed for the family and the architects to remain on the same page, ensuring that this minimalist box of beauty was exactly what was desired. If you are building a new home or making renovations to your current home, ask your architect professionals for a detailed drawing or a 3D model of what the space will look like after construction. This will allow you to truly envision the final results! Do you like the neutral tones used throughout this design?